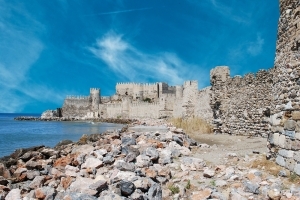 If you are fascinated by fortified strongholds and castles, Mamure Kalesi will meet, and even exceed all of your expectations. 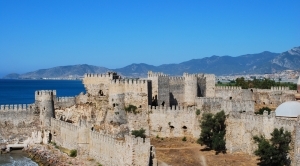 The fortress is the best preserved and the largest building of its kind in the whole of the Mediterranean basin! To this day, all its towers have been preserved, and there are as many as 36 of them. The present building dates back from the 12th century A.D. and was built by the rulers of Armenian Kingdom of Cilicia. However, there is evidence that the defensive walls were erected in the same place as early as in the 3rd century BC, and certainly the Romans built here a fortress in the 3rd century of our era. There is no doubt that the choice of location was determined by its excellent strategic position, next to the sea and an important trade route from east to west of Anatolia. The castle was extended by the Seljuks when the area was taken over by sultan Alâeddin Keykûbad. It’s the same ruler who ordered to build fortifications in Alanya. In the case of Mamure Kalesi he only needed to complete this project of previous rulers of this region. On the courtyard of the castle there is a mosque, which is used for religious ceremonies to the present day. The castle is not so popular with tourists, so it seems likely that we will probably be ones of the few guests there. The usher will show us the direction of visiting route and then we will be given a completely free hand. It is worth to wander around the whole structure, and if we can dare to do that, to climb the walls and walk along the ramparts. Special care should be taken there, because it is high in places and there is no protection against falling. Looking from the walls of the castle one has a magnificent view on the sea and the mountains, and on the walls it is easy to see the ubiquitous lizards. A colony of turtles caretta caretta at the entrance to the castle may be considered as additional attraction. It is worth taking at least one hour to explore the fortress, but it may be too short to reach every nook and cranny there. We do recommend to supply yourselves in the drinking water, because there is no possibility to top up the reserves and the sightseeing takes place in direct sun most of the time. It may give you some trouble. There is a campsite next to the castle, so if we will not be captivated with the area or we will be seize with desire for sunbathing on the beach next to the fortifications, we can stay here for the night. 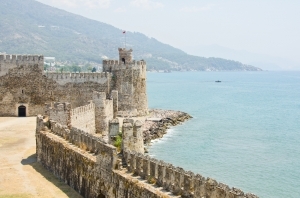 Mamure Kalesi is located 6 kilometres from the centre of Anamur, so the distance encourages to look for road transport, although the possibility of getting there on foot is not strange to us. However, due to the fact that the walk along the unpleasant, asphalt road takes an hour, we recommend to use the dolmuc. It is easy to find the dolmuc to the Mamure Kalesi around the BP gas station situated on the main road through Anamur, just to the east of the city centre, near the banana monument. Ultimately, the dolmucs head towards to the place of Bozyazi and so are they usually marked. You should get off right at the castle, which is clearly visible from the road. The driver will stop if we tell him that we want to reach the Mamure Kalesi.